By now, you’re ready for a short Caribbean cruise. All aboard ArToro. This restaurant glides into the former space of 7T8 European Fusion, the design of which hasn’t been dramatically altered. The textured, gray-black wall still curves like a wave and the round dining room window suggests a porthole. Artie Berke, who also runs Nina’s, a casual, Italian eatery on Main Street, steers a course toward Puerto Rico, Cuba and the Dominican Republic here. A lot of the fare is flavorful and good. But there are ups and downs throughout. Dining here will require some patience. You may be waiting at the doorway and eventually seat yourself on a weekday night. On a recent evening, a fine-tuned guitarist played some easygoing songs that would be at home on SiriusXM’s The Coffee House, with an occasional nod to pop and Margaritaville. On a Saturday, when the room is packed and pulsating, an amped-up soundtrack of rumba and salsa, tambourine and trumpets may accompany your wait. Delays are weekend probabilities and since you can’t hear yourself, you’ll be tempted just to jot down choices and offer them to your very friendly, very beleaguered waitress. 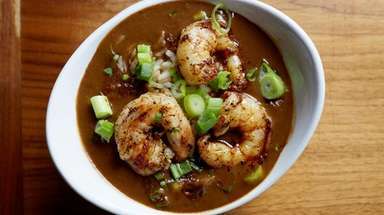 Berke offers savory Puerto Rican-style chicken soup and bracing black bean soup. 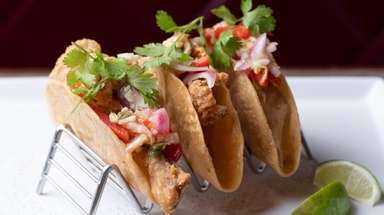 Fish tacos with red snapper and chile-lime slaw stand out, as do the snappy, inviting Cubano sliders and the pork belly with sofrito-mustard sauce. 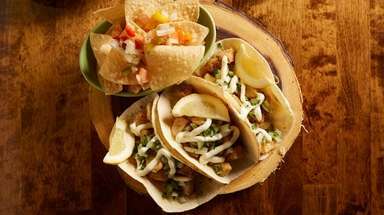 But an opener of fried chicken seems more batter than bird; fried beef and chicken empanadas, very dry; and the mofongo cups that hold spirited pork, steak and garlic shrimp could be softer. Steak tacos: chewy. The choices improve with a spin on paella. It doesn’t have the coveted socarrat, that crunchy rice at the bottom of the pan. 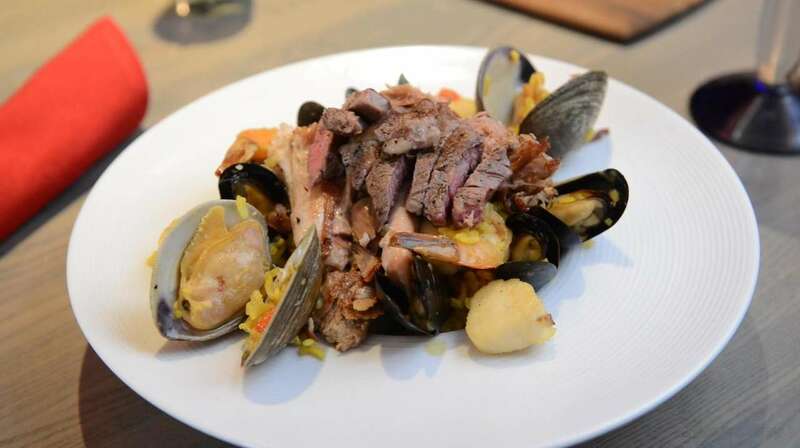 The shellfish, pork, beef, chicken and chorizo in the todo paella, however, are carefully cooked and satisfying. Velvety, creamy corn custard is excellent with sauteed vegetables, yucca and plantain fries. You could enjoy it unaccompanied, or share it as an oversize side dish. 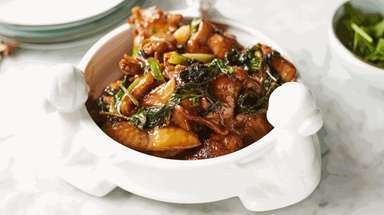 It will go well with the tender, braised oxtail, a production that takes in chorizo, yucca, vegetables and rice. Or try it with the juicy, simply grilled steak. Mojo roast pork jumps off the menu with its Cuban combo of black beans and rice. Continue your Cuban trip with huachinango enchilada, or fillet of red snapper in a light tomato sauce, perched on white rice and finished with tostones. 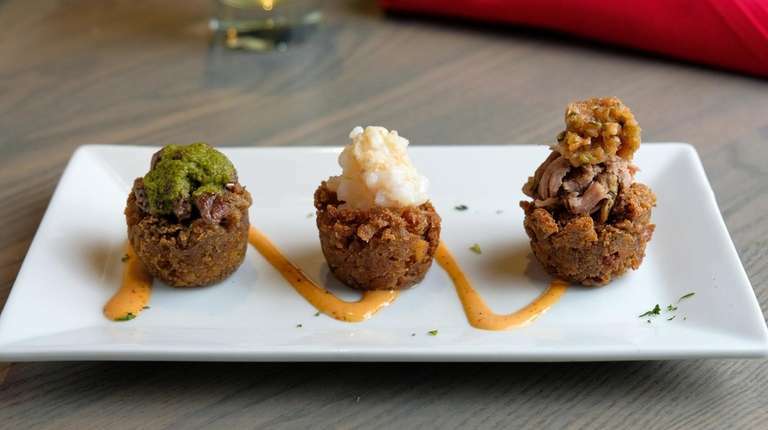 A special of nutty, sweet seared scallops surrounded by a mellow mofongo has easygoing appeal. The kitchen sends out a well-seasoned pastelon, a layered affair that suggests lasagna on a tropical vacation. Fried sweet plantains, queso blanco, ground-meat picadillo and assorted vegetables complete it. A slice of Dominican rainbow cake does have layers of color and a light, sweet taste. Refresh yourself with mango mousses served in a delicate chocolate shell. ArToro ensures that you feel like spring and summer with cocktails. El Triunfo is the potent result of a mojito mating with a margarita; the Matador, a lush tequila anejo-driven margarita gilded with Cointreau; and the fired-up Artista, with tequila blanco, pineapple, mango and plenty of jalapeño. 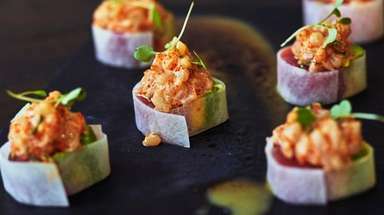 Order carefully and take a laid-back approach, and you’ll like docking at ArToro.